Kayak Rentals on St. Pete Beach. The waters of Tampa Bay and Gulf of Mexico off of St Pete Beach are great places to cruise in a kayak. You can check out the birds and sea life, and enjoy the tranquility of the sea from the seat of a stable sit-on-top kayak. Off the beach or on the bay side, St Pete Beach is a great place to paddle. North Beach Windsurfing can you get you out on the water in easy to use sit-on-top kayaks in one person or two person configurations. The tandem kayaks are even long enough to have a small child along for the ride! Depending on your interests and ability level we can steer you to the best location by providing detailed maps and directions. What it’s like to kayak at St. Pete Beach. Touring the coastline and bays from a kayak is a great way to see the crystal clear water of St Pete Beach. 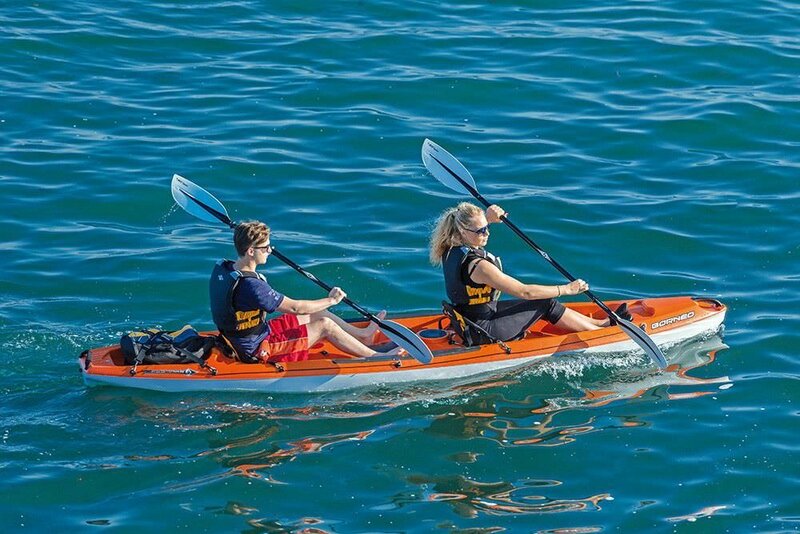 A sit-on-top kayak is easy to use, and we make sure our boats are easy to paddle. You can see the sights, get a little exercise, and soak up the sun and sea air from the seat of a single or tandem kayak. Your Florida beach vacation will be even more memorable when you get off the beach and off the beaten path out on the water! 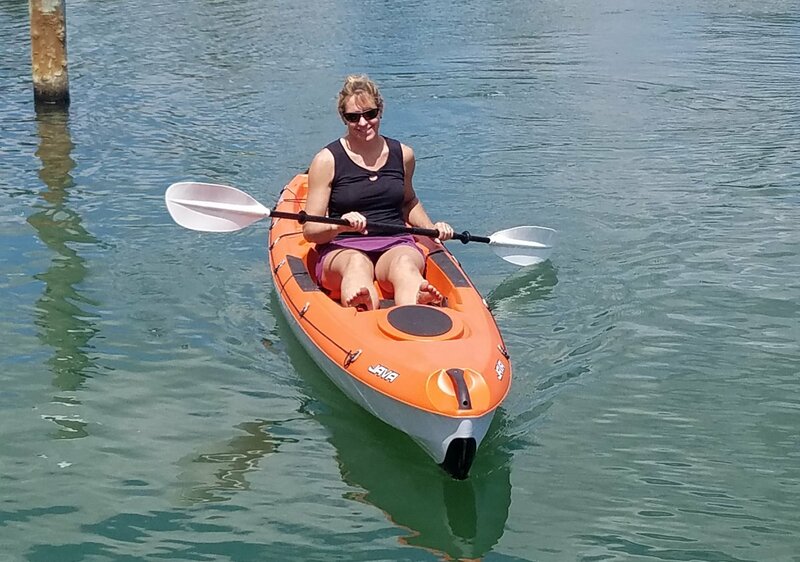 We offer top of the line, sit-on-top kayaks as rentals, so you are guaranteed a high quality boat for your fun in the sun. Need some refresher tips or starting pointers? We’re happy to provide you with paddling instructions with each kayak rental. Ready to create new memories with your friends and family? For multi-day rentals, call us at 727-656-6569. Experience natural Florida with a paddling eco-tour . North Beach Windsurfing can be your guide on a kayak nature tour. Cruising around the edges of mangrove islands, finding the spots where you are most likely to see manatees or dolphins - leave worrying about the current and tide to us! 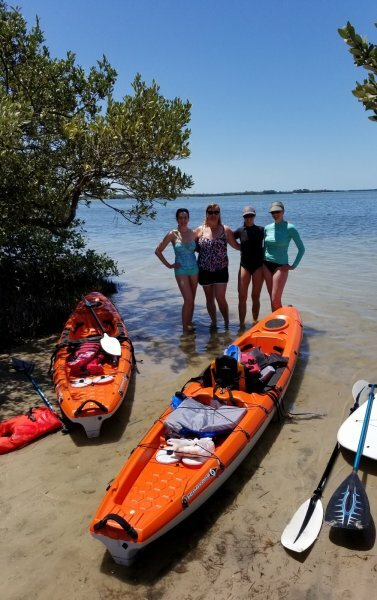 We can tailor a tour to your group's desired level of activity and provide kayaks and paddle boards. We start with instructions on basic paddle techniques and then get on the water for over an hour of paddling time and sightseeing. Bring your waterproof phone or camera to get incredible shots of unique scenery you’ll only find in Florida! Is a paddling tour right for you? The tour is perfect for friends and family of all shapes, ages, and sizes. You don’t have to be in peak physical condition to participate in the tour. We have boards and boats that work for everyone. If you have concerns that your child is too small, or you’re too tall, give us a call, and we’ll make sure you’re confident in the safety and fun of the Eco Tour. Eco tours are for groups, too. Groups can be as small as 2 people or as many as 8 people - if your group is larger than 8 people, give us a call to see how we can better accommodate you! We are currently booking tours on Sunday mornings and Thursday afternoons. However, if you would like to arrange a custom time, give us a call at 727-656-6569, we’re always happy to work with you! Ready to take the kayak tour of a lifetime?